From the South: I-95 runs parallel to the eastern seaboard.Jump on any where and head towards Portland, Maine. In Portland take Exit 44 or Exit 52 to I-295 all the way to Brunswick. Take exit 28 to coastal Rt. 1 north. 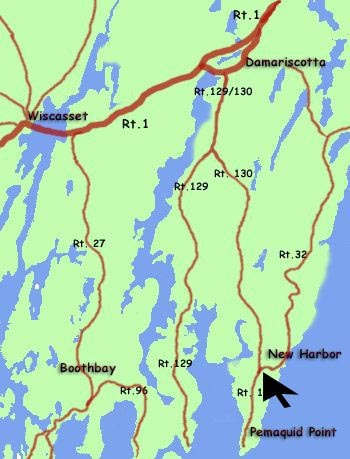 Continue through Bath and Wiscasset until Damariscotta.This exit will be the 2nd right after the Dodge/Jeep dealership. Drive through downtown Danariscotta 1/2 mile and turn right at the light. This is Rt 120/129. Continue 12 miles until the corner of Rt 130 and Rt 32. The Fletcher Gallery will be on your left. From the North: Take coastal Rt. 1 south to Waldoboro. Turn left at the second light onto Rt 32 at Hannaford Grocers. Follow Rt 32, (a lovely country road) about 18 miles to the end of Rt. 32. Fletcher Gallery will be on your left at the corner.